Does your child enjoy music? Does he, or she, like to sing around the house? Have they ever expressed an interest in learning to play the guitar? Younger children need to move at a slower pace than adults. Jean Welles has taught many guitar classes for younger children, ages 5-9, and know how to pace the lessons for that age group. 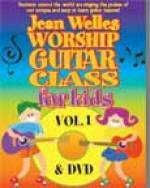 We are pleased pleased to offer this Jean Welles Worship Guitar Class for Kids program. This worship guitar class program for kids will not only teach your child how to play the guitar but can also help them develop a heart of worship. The lessons start with one finger chord worship songs and plucking out melodies with individual fingers. Here is what your child, or children, will learn. How to hold down a note to get a clear tone on the guitar. A couple worship songs with the melody plucked to strengthen their hands. Half a dozen worship songs they can sing & play.. 11 guitar chords . How to read guitar tab and chords charts. How to make up their own verses. Instead of just teaching, she wanted your child to relate to another child learning. The lessons are filmed with a young girl. You can see an excerpt of lesson one in the video below. This is a little over half of the first lesson. A Practice Session for every lesson, that starts with prayer. A Practice Chart you can photocopy. Did you know that there are Many Benefits in Playing and Learning Music? Researchers at the University of Montreal used various brain imaging techniques to investigate brain activity during musical tasks and found that sight-reading musical scores and playing music both activate regions in all four of the cortexs lobes. Grades go up. Ive always heard the studies done, but then a woman at a trade show told me that her daughter loved my Worship Guitar Class program and that her grades at school actually started improving too! When a child is shy, music can be the bridge to bring them out of their shyness. I know a Kindergarten teacher that always recommended getting involved with an instrument for very shy children... it works! Studying music encourages self-discipline and diligence, traits that carry over into intellectual pursuits and that lead to effective study and work habits. Studies show that kids learning music have significant improvement of spatial-temporal scores - useful for Math & Science! Music has a great power for bringing people together. This can be the beginning of a lifetime hobby and source of joy. Worship elevates Music to a Higher Realm and Enriches our Lives! We are told to keep our eyes on Jesus. Participating in worship helps us to focus on Him. When we are focused on God, we experience His Peace. Its a way we can say "Thank You" back in appreciation for all He has given us. Its easier to hear Gods voice when we are focused on HIM. We were make to worship God and it blesses God and us! "The kids version of the Worship Guitar Series has been outstandingly received down here. The kids enjoy it. It’s at a level they can understand. The parents enjoy it because we dont have a lot of people in our area, were a small South Texas town, that provide guitar training or anything like that. And having the DVD and Book together they feel like its wonderful for their kids. The product itself has been very well received." Maureen Spruill, Foundation Christian Resource Center in Pleasanton, TX. With 'Mastering Finger Picking' you will learn techniques and songs to help improve your fingerpicking skills.